Goal Setting for Teachers - Classroom Activities: Social Studies, Reading, Writing, and More! If you are anything like me, then you set goals for yourself. When it comes to my goals though, I tend to set lofty goals, and I often times set too many goals. I end up being hard on myself when I don’t meet them, and I am sometimes left feeling defeated, almost like I haven’t really accomplished much at all. This can apply to goals in teaching, fitness, family, whatever. Sometimes with my goal setting, I aim high, usually looking too far into the future, which can be a real problem. It can cause me to skip over the present, making me lose sight of all of the “baby-step goals” that I need to accomplish in order to meet the ultimate long-term goal. Think of baby-step goals as the step by step plan for reaching the “big-picture goal”. My big-picture goal may be to lose 20 pounds, but my baby-step goal for today may be that I just need to make sure I walk for 30 minutes. Another big-picture goal may be to have all students in my class reading on grade level by the end of the year, but my baby-step goal for today may be to implement a strategy to help Johnny learn the few basic sight words he has been struggling with. When I think of goal setting in education, I can’t help but think about the lofty long-term goals and how much stress they cause teachers. As I reflect on my goal setting as a teacher, I think about all of the grand goals I have set over the years. The reality of it is, someone else usually set those lofty goals for me, which is why I always felt so stressed. It was up to me though to figure out how to meet those goals. When I say goals were set for me, they really were. Goals like...... all of my kids will be reading on grade level by the end of the year. Another goal was 100% of my students will score on-grade-level in math. Those goals are fine and dandy, but they are so long term, so ‘big picture’. They seem so out of reach, especially if you are a 4th grade teacher and you have kids reading on a first grade level. Because of that, I struggled for years to even see the baby-step goals that I was accomplishing each day. Having baby-step goals can give you a sense of accomplishment, especially as a teacher. Teaching can be overwhelming, stressful, and many days we can leave feeling like we worked our tails off, and we barely feel one step closer to meeting the big-picture goal. The problem is, you can’t see and appreciate the present because you are so focused on the future. You know that saying, "just stop and smell the roses", well.. sometimes we need to do that. And that's where sticky notes come in. It's a bright idea that helps me focus on the present. Sticky notes for goal setting? Yep! It's so easy and worth while. Each week when you are making your lesson plans, take a minute to think of one "baby-step goal" for that day. For example, on Monday, maybe you want to make sure you meet with your low readers for 30 minutes. You are going to take a sticky note, write the goal, and stick it with the plans for that day. On Tuesday, maybe you want to set a baby-step goal to pull 5 kids in math to review multiplication. Keep in mind that those baby-step goals mentioned above are both factors in helping you meet the "big-picture" goals. Like the goal you set for yourself to pull low readers. That baby-step goal is going to help you meet the big- picture goal of helping you have all kids on grade level by the end of the year. Likewise, when you pull 5 kids to review multiplication, that is also helping you work toward the big-picture goal of getting 100% of your kids on grade level. Once you accomplish your daily baby-step goal, you can either throw the sticky note away, leave it in place in our plans, or you can keep a running journal of all your accomplishments, which would mean removing the sticky note from your plans and adding it to a journal composition notebook. By the end of the week you will have met 5 great goals. By at the end of the month, you will have met about 25 goals. At the end of the year, you will have met 180 goals. That's a lot of sticky notes to reflect on! It's something to be proud of. Why just one goal a day? I know I can do more than that. You are not just accomplishing one thing each day. You may actually accomplish ten things in a day or more. That’s great, fine, and dandy! The idea behind this little sticky note goal-setting plan is to start each day with one goal, one thing you want to make sure you accomplish, and then walk out each day having met that goal. It's a way for you to feel accomplished. It's a way for you to leave work each day knowing that you achieved what you set out to do. That's a good feeling! So, what are you waiting for? 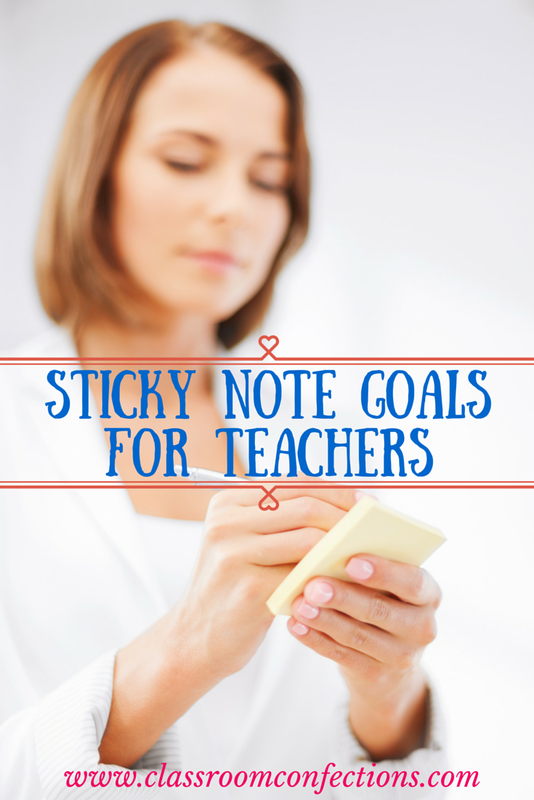 Take a look at your lesson plans, grab some sticky notes, and start setting a daily goal. OH! and here is something else wonderful about this little goal setting activity. If you get to then end of the year and you don't have 100% of your kids on grade level (after all, you knew they set an unrealistic goal for you to begin with)..... you will be able to see 180 goals you did accomplish. Don't feel defeated. Feel proud!! Please do check out other bright ideas by visiting the links below.